. (1392). بررسی امکان تهیة نقشة خشکیدگی تک‌درختان بلوط ایرانی(Quercus brantii Lindl.) با استفاده از تصاویر ماهواره‌ای Rapideye وAster-L1B. 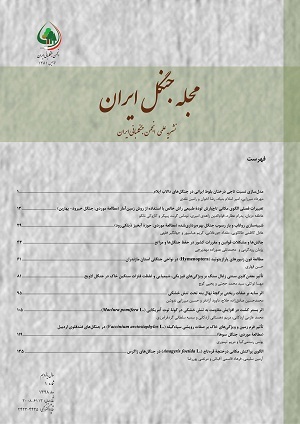 مجله جنگل ایران, 5(4), 443-456.
. "بررسی امکان تهیة نقشة خشکیدگی تک‌درختان بلوط ایرانی(Quercus brantii Lindl.) با استفاده از تصاویر ماهواره‌ای Rapideye وAster-L1B". مجله جنگل ایران, 5, 4, 1392, 443-456.
. (1392). 'بررسی امکان تهیة نقشة خشکیدگی تک‌درختان بلوط ایرانی(Quercus brantii Lindl.) با استفاده از تصاویر ماهواره‌ای Rapideye وAster-L1B', مجله جنگل ایران, 5(4), pp. 443-456.
. بررسی امکان تهیة نقشة خشکیدگی تک‌درختان بلوط ایرانی(Quercus brantii Lindl.) با استفاده از تصاویر ماهواره‌ای Rapideye وAster-L1B. مجله جنگل ایران, 1392; 5(4): 443-456. مسئله‌ای که امروزه برخی توده‌های جنگلی را در ناحیۀ رویشی زاگرس تهدید می‌کند، وقوع خشکیدگی در درختان بلوط ایرانی است. در سال‌های اخیر، توده‌های بلوط ایرانی در منطقة دشت برم استان فارس نیز با خشکیدگی شدیدی مواجه بوده‌اند. در حفاظت و مدیریت این جنگل‌ها، به‌کارگیری سنجش از دور ماهواره‌ای تا حد زیادی از دشواری و هزینه‌های تشخیص این پدیده به‌روش میدانی می‌کاهد. تاکنون استفاده از تصاویر ماهواره‌ای رایج با تفکیک مکانی و طیفی متوسط مانند تصاویر Aster– به ‌تنهایی- در تشخیص خشکیدگی تک‌‌درختان در مقایسه با خشکیدگی در سطح توده‌های جنگلی نتایج رضایت‌بخشی را نشان نداده است. در پژوهش حاضر، قابلیت‌های مکانی تصاویر سنجندة جدید Rapideye در کنار سنجندة چندطیفی Aster-L1B در تشخیص خشکیدگی تک‌درختان بلوط بررسی شده است. همچنین از روش‌های پردازش تصویر چندسنجنده‌ای، طبقه‌بندی نظارت‌شده و آزمون‌های تفکیک‌‌پذیری طیفی به فراوانی استفاده شده است. نتیجة بررسی صحت نشان می‌دهد که صحت کلی و ضریب کاپای نقشة خشکیدگی تک‌درختان برای تصاویر Aster به ترتیب 75 و 56 درصد است و فنون تلفیق تصاویر چندسنجنده‌ای به‌کار ‌رفته، به‌ویژه به ‌روش گرام- اشمیت چندسنجنده‌ای آن را تا 94 و 88 درصد افزایش می‌دهد. تصاویر Rapideye به ‌تنهایی نیز به‌ترتیب معیارهای صحت 97 و 94 درصد را ارائه می‌کند که نشان‌دهندة قابلیت اختصاصی باند لبۀ‌ قرمز در شناسایی موضوعات ناشی از ماهیت فیزیولوژیکی پوشش‌های گیاهی مانند خشکیدگی است. Nowadays, Persian Oak (Quercus brantii Lindl.) Defoliation is one of the main problems, threatening Zagros forest stands. In recent years, the oak stands located in Barm plain (Fars province) also have been facing with a severe defoliation. To protect and to manage the forest stands, employing satellite remote sensing reduces difficulties and expenses of field-based methods for detecting and delineating the defoliation extents. Using current spatial and spectral moderate resolution satellite imageries such as Asters’, by itself, have not resulted satisfactory achievements in detecting the defoliation in single tree level in compare to forest stand level. In the current research, capabilities of high spatial resolution newly-introduced Rapideye Imagery has been investigated in compare to multispectral Aster-L1B imagery in order to detecting the oak single tree defoliation. Plenty of multi-sensorial image processing techniques, supervised classification methods and spectral separability analysis have been employed in this research. The results of accuracy assessment indicate that overall accuracy and kappa coefficient of single tree defoliation map, derived from Aster-L1B imagery, were 75% and 56% respectively. It is while the employed image fusion techniques; particularly multi-sensorial Gram-Schmidt’s has increased the both heuristics up to 94% and 88% in turn. Rapideye imageries, by itself, resulted considerable high accuracy heuristics up to 97% and 94%, seem to be related to its Red Edge capability, specifically designed for detecting themes caused by physiological characteristics of vegetation covers such as defoliation.